My compliments to ALL SINDHIS inclusive of me and more specifically all those who worked hard - few names that I remember well are Bhagwan Gidwani, Dial Gidwani, Ram Jethmalani, Gobind Jhangiani, Suresh Keswani, Ranjit Butani and some more. But now we must still work for restoration of SINDHU DARSHAN instead of SHINGE DARSHAN as put forward by the Tourist Minister. We must also work towards the plight that 500000 Sindhis are gong to be in if their homes in Ulhasnagar are demolished. My view is that their constructions be given a chance to legalize and to make good for any irregularities in the construction. For that purpose they must be given ample time to carry out legalizations. 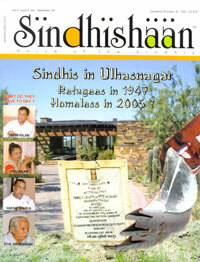 On top of that one calamity over the other would continue to fall on and for that purpose it is essential now to form a STRONG SINGLE UNITED INTERNATIONAL INDIAN-SINDHI COUNCIL or FEDERATION to protect we Sindhis against all ills in the future and to upgrade and safeguard SINDHI interest in every field of life. That is my appeal today! Sindhis of my age are fast disappearing from this world and let us do a wise start now for our younger ones to keep following up for future betterment.